Judy ponders her life. The Four of Cups reflects the fact that creativity, genius and madness are often only different profiles of the same gift. It can be as difficult to control one's own spirals into depression as it is to control one's own bursts of creative genius. 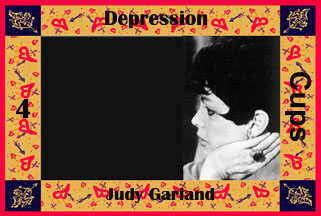 Judy Garland: The Live Performances!